On Sale Now! 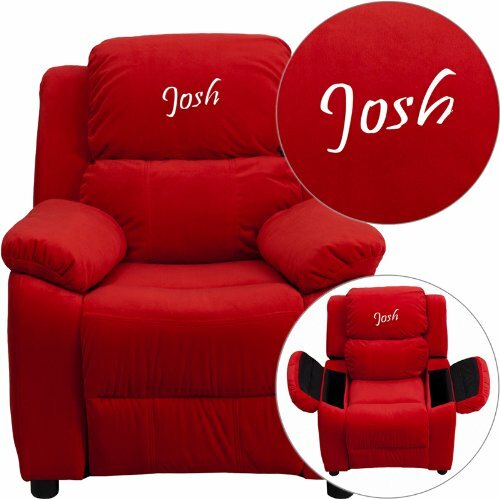 Save 3% on the Kids Personalized Deluxe Recliner by Flash Furniture at Indsight. MPN: BT-7985-KID-MIC-RED-EMB-GG. Hurry! Limited time offer. Offer valid only while supplies last. BT-7985-KID-MIC-RED-EMB-GG Features: -Child's recliner. -Microfiber upholstery. -Flip-up storage arms. -Solid hardwood frame. Product Type: -Chair. BT-7985-KID-MIC-RED-EMB-GG Features: -Child's recliner. -Microfiber upholstery. -Flip-up storage arms. -Solid hardwood frame. Product Type: -Chair. Generic Dimensions: -Storage arm size: 11" H x 3.25" W x 6" D. -Overall dimensions: 28" H x 25" W x 26'' - 39" D, 32 lbs. Dimensions: Overall Height - Top to Bottom: -28 Inches. Overall Width - Side to Side: -25 Inches. Overall Product Weight: -32 Pounds. Seat Size : 12W X12D X15H. Seat Thickness : 2". Back Size: 22W X17H. Arm Height From Floor : 18" H. Arm Height From Seat : 4" H. Assembly Requirements : Some Assembly Required. Weight Capacity : 90 Lbs. Material : foam, vinyl, wood. Product Dimension : 26" - 39" L X 25" W X 28" H. Weight : 29 Lbs. Weight Capacity : 90 Lbs. Material : foam, vinyl, wood. Product Dimension : 26" - 39" L X25" W X28" H. Weight : 29 Lbs.